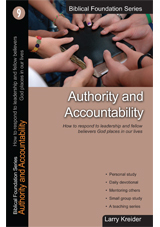 In this ninth Biblical Foundation book, Authority and Accountability, we learn that the Lord has chosen to give His authority to men and women in various areas including the government, our employment, the church and our families. If we have a healthy understanding of the fear of the Lord, we will understand why God places authorities in our lives. The Lord delegates responsibility to the authorities so that He can use them to bring protection, adjustment and structure into our lives. A proper understanding of authority will bring security into our lives.